ABSTRACT: The usual methods applied to recover calcareous nannofossils from claystones are extremely simple, cost-effective and fast. Some samples, however, exhibit heterogeneous mixtures of biogenic materials, detrital particles and other aggregates that visually mask the coccoliths under the microscope. For instance, a high content of organic matter in associationwith calcareous nannofossil specimens was observed in outcrop samples of the Vaca Muerta Formation (Neuquén Basin, Argentina). 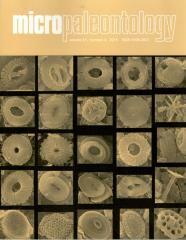 To solve this problem, traditional preparation techniques are herein improved to aid better visualization of calcareous nannofossils. Sixteen tests were qualitatively and quantitatively evaluated, testing the efficiency of some chemicals and physicals methods such as the addition of a solvent (oxidizing agent) in the smear slide technique, as well as the use of ultrasound in the random decantation technique.